That is how we arrived to Rising Voices with a little push to convert this idea of helping Amazonian community radio stations have their own websites and to stream online into action. The project seeks to help community radio voices of the indigenous Achuar and Shuar peoples from the Ecuadorian Amazon with Radio Voice Arutam, Radio Voice of NAE and Radio Voice of the Cascades that broadcast on FM radio to be able to share their information, stories, and music in their own language on the internet. 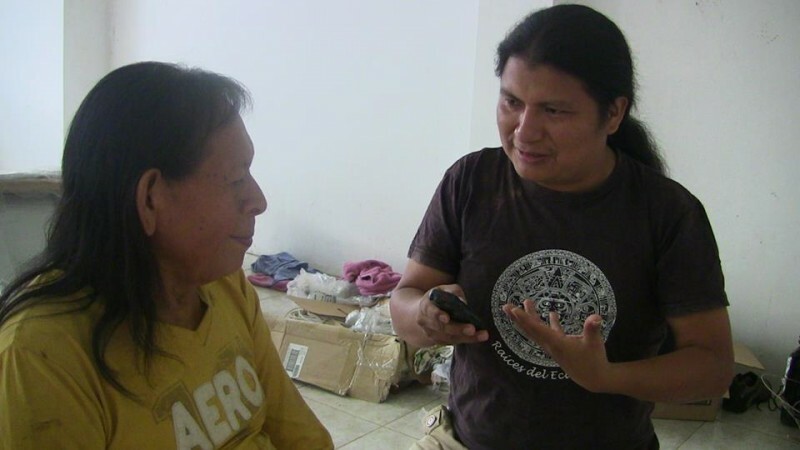 For this we will conduct a training process for indigenous communicators, primarily young people, in the use of free tools for the creation of their own websites, online broadcasting, and podcasting in order to strengthen intergenerational dialogue in their own language: shuar and achuar. Radio Voice of Arutam is one of the oldest radio stations in the Amazon, and is part of the organizational process of the Interprovincial Federation of Shuar Centers. So far this radio has broadcast on a website that has not been updated, and the information published does not reflect the reality, struggles, culture and the identify of the Shuar people. Radio Voice of NAE is a new radio station and the first Achuar radio station in Ecuador. Initially headquartered in Taisha, a small community in the dense jungle border with Peru. For technical reasons, the electricity was unreliable, so the radio moved to the city of Macas. From there, voices are broadcast of those people who come to the radio to report news to their families, speaking in his or her own language or to share music of artists of one's nationality, or to amplify the song of their grandfather and grandmother from within the jungle. Radio Voice of the Cascades is a new radio station and is created from the organizational process of the Shuar Arutam Peoples, and is located in the community of Tiwinza. This radio does not have an internet connection, but for this project, we will be broadcasting from Sucúa, which the radio head quarters. Many Shuar youth want to publish on websites and want to create new content about what the community does on a daily basis. The Shuar and Achuar peoples are brothers, and their voices tell us stories from nearby villages. Despite the process of colonization, they still maintain their language, their stories, their organization, their territory, and their lives. Follow along with the project at Wambra Radio.